The Punjab government has decided to implement the condition making newly recruited teachers in the state to serve for three years in village schools. Director public instructions (secondary) Punjab Jagtar Singh Khatra stated this here today. Congress legislator from Qila Raipur Jassi Khangura has contested the claim of Chief Minister Parkash Singh Badal made on the floor of the House during the last session of the Vidhan Sabha wherein he had said that the Adarsh Schools scheme received kudos from the deputy chairman of the Planning Commission Montek Singh Ahluwalia. Quoting Badal, he said Ahluwalia was so enthused by the Adarsh proposals that he stated it should be extended to the whole country. The SGPC has finally dismissed Diljit Singh Bedi, assistant secretary, with immediate effect following charges of moral turpitude here today. The order issued by the SGPC secretary has reversed its own three previous decisions taken by the SGPC chief and executive committee. How pension cases of “ retiring” government employees are treated in Punjab, the office of accountant general, empowered to authorise pension after dealing with such cases, has shed light on it. Nangal Municipal Council officials are busy getting RCC slabs covering main drain of the town in the Rajnagar area removed. They have engaged two labourers who are finding it hard to break the concrete cover with hammers. They are working at the site for two days and have been able to break just a few feet area. Subash Trehan of Urban Estate here booked 11 berths in Chhattisgarh Express (train number 3238) from Jalandhar to Mathura for March 11, last year. As the Union Public Service Commission has reportedly declined to hold selection of officers for the Punjab Civil Service (PCS) and allied services, the Punjab government has made up its mind to entrust selection of the PCS officers to the Punjab Public Service Commission (PPSC). Science, technology and environment minister Bikram Singh Majithia today formally commissioned eight Bagasse-based cogeneration projects (104.25 MW ). These have been set up with an investment of Rs 422 crore. Punjab has chosen as a nodal state by the Union Agriculture Ministry to implement the National Bamboo Mission Programme for promoting cultivation, value addition, processing and marketing of bamboo crop. Services of four regular ETT teachers, recruited by the Sangrur Zila Parishad, have been terminated by the authorities on the charge of submitting fake residence certificates to get job. Accusing Guru Nanak Dev University vice-chancellor Dr Jai Rup Singh of corruption and seeking a probe, Ram Sharan Paul, convener, Punjab Ekta Manch, here today sent an affidavit to the Chief Justice of the Punjab and Haryana High Court. Patna Sahib Jathedar Iqbal Singh today again criticised Akal Takht Jathedar Joginder Singh Vedanti for “unilaterally” making an appeal to Giani Balwant Singh Nandgarh, Jathedar, Damdama Sahib, to call off the dharna. 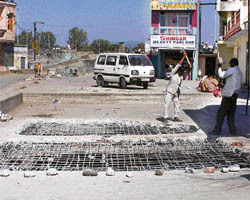 The Congress has threatened that it will launch an agitation if steps are not taken to improve the condition of the Ropar-Anandpur Sahib road. Sessions judge G. K. Rai today referred the attempt to murder and land grab case involving BIS Chahal former media adviser of former Chief Minister Amarinder Singh to a fast-track court for trial. The crime branch today produced its first inquiry report by SP Ranjeet Singh Dhillon, crime branch, before the high court Bench of Mr Justice L.N.Mittal. The court fixed March 26 for the next hearing. Issuing a notice of motion for April 22, a Division Bench of the Punjab and Haryana High Court has allowed five Punjab Agriculture University professors to continue in service on the posts they were working on. Three of the petitioners were to retire on February 29 upon attaining the age of 60. The Punjab School Education Board has put roll numbers for open school and private candidates on its website www.pseb.ac.in <http://www.pseb.ac.in>.